The Vios is another vehicle from Toyota which is a perfect example of all the practical aspects offered in perfect equilibrium, wrapped in a modern looking package. The Vios recently received a facelift, which has managed to make it look much fresher and contemporary than before. The Yaris inspired from the end and interior cabin layout has made the car much more appealing, while the car now has been equipped with several new comfort and convenience features. And when it comes to safety features, nothing can beat this most affordable sedan from Toyota. The core strengths of previous generation Vios – rear seat comfort and supple ride quality – have been retained in this new version as well. Powering the Toyota Vios is a 1.5-litre four-cylinder petrol engine coupled to a CVT transmission, which belts out a decent maximum power output of 107 PS and a peak torque output of 140 Nm. Vios is available in 5 different colors - Silver Metallic, Attittude Black, Dark Blue Metallic, Super White II and Red Mica Metallic. Sold in many countries as the Toyota Yaris sedan, the new Vios comes with the same trustworthy package like the other Toyota vehicles along with a touch of modernity. 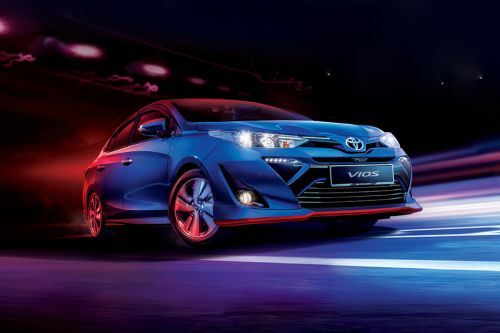 The Toyota Vios in Malaysia is available in three different variants – J, E and G. The price of the sedan starts at RM 77,200 and the color options available are Dark Blue Metallic, Red Mica Metallic, Attitude Black, Silver Metallic and Super White. The interior of the Toyota Vios does feel contemporary, however, the overall layout might look a bit boring and too functional for the new-generation buyers. The steering wheel has been lifted off from the Toyota Corolla and comes integrated with controls for audio, Bluetooth and MID controls. The instrument console looks quite distinctive with a separate and dedicated MID screen which has a whole lot of data on display. The vertical design of the center console looks quite simple but does get the essential components. It includes a 7-inch touchscreen infotainment system which has got USB Mirroring, Tuner, HDMI, MP3, Voice Dial, AUX- Jack, Bluetooth & Reverse Camera with six speakers and a cool looking automatic climate control console. The Toyota Vios comes with many other prominent comfort and convenience features like full black leather upholstery, push-button start with keyless entry, drive mode switch (ECO and SPORT modes), tilt adjustable steering wheel, electrically adjustable and foldable rear view mirrors, ambient lighting, rear AC vents and height adjustable driver’s seat. Space inside is ample with no shortage of legroom and knee-room at the rear. The Toyota Vios has changed drastically from being a dull looking vehicle to a car with many sporty and aggressive design elements which help it in keeping up with the changing trends. The front fascia has got a busy and aggressive look. The chrome grille is partitioned from the centre with the sleek projector headlamps flanking it. Below this grille is a trapezoidal air dam on the front bumper, the upper corners of which are ornamented by the daytime running LEDs. The vertical design for the fog lamp housings also provide the car with a distinct look. The side profile of the Toyota Vios manages to give it a curvaceous appeal thanks to the nice curves on the front fender and near the tail lamp assembly at the rear. The 16-inch diamond cut alloy wheels on the top-spec variant look beautiful as well. The rear profile of the Toyota Vios looks a bit dull in comparison to the front and the sides, however, it manages to appeal in its own way. The curvy tail lamps do look good and come with LED elements to make them look modern as well. The Toyota Vios has always been one comfortable sedan to be in and this new version takes things even further. The car has got McPherson Strut with Stabilizer up front and Torsion Beam with Stabilizer at the rear which makes up for smooth and plush ride quality. The Vios is also one of the very few cars in this price range to get disc brakes at both the ends resulting in a very strong stopping power. The Toyota Vios for the Malaysian market gets only one powertrain option – a 1.5-litre four-cylinder petrol engine that is mated to a CVT. The engine pumps out a maximum power of 107 PS and a peak torque of 140 Nm. This engine proves to be decent for getting the job done with linear power delivery, however, on outright stretches, one does feel the lack of power lower down the rev range. One of the safest cars in this category, the Toyota Vios is loaded with a lot of safety features. The car has been blessed with seven airbags, ABS with EBD and Brake Assist, ISOFIX mounts, seat belt pre-tensioners with force limiters, Blind Spot Monitor (BSM) with Rear Cross Traffic Alert, Vehicle Stability Control, Traction Control, Hill-start Assist Control, Front Digital Video Recorder, and front & rear parking sensors. The Toyota Vios might not appeal to those who are young at heart owing to its very functional approach in almost every aspect. However, this very mature approach makes it a very practical car. The revamped styling and introduction of a couple of new features have made it a modern sedan, while at the same time, the smooth ride quality makes it a great car to drive or to be driven in. The mileage and the quiet driving experience has made owning this car worth it for me.